Apple Watch preorders will begin April 10 at 12:01 a.m.
New details for the Apple Watch are beginning to surface ahead of its release this month, including the precise time you’ll be able to start preordering Apple’s first wearable. Apple updated its webpage for the Apple Watch today, notifying potential customers that preorders will be available starting at 12:01 a.m. Pacific on April 10. Apple revealed that preorders would start April 10 at its Apple Watch event last month, but until now we haven’t known the exact time you’d be able to charge your credit card for Jony Ive’s timepiece. Details about AppleCare+ pricing were also revealed today, putting insurance for the Apple Watch Sport at $59 with the price increases for the higher end models. Apple Stores across the United States will have Apple Watch units on display starting April 10 so you can find your favorite band combo before preordering. The first units will hit stores April 24, but if you’re planning to walk into the store and buy one, you’ll be out of luck. 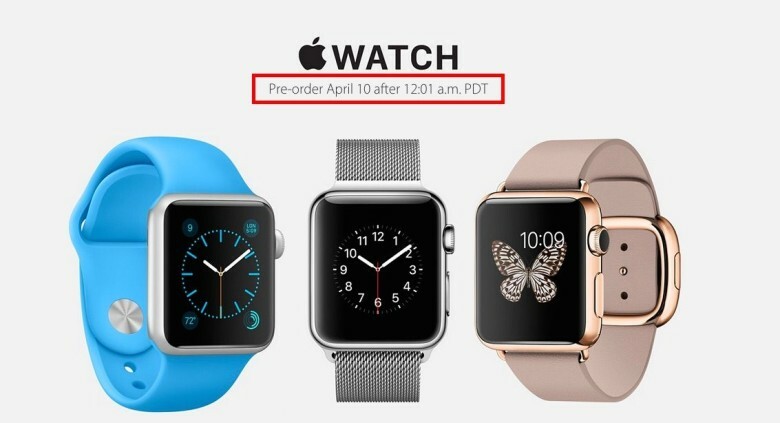 Apple Watch will be available for sale by reservation only when it lands later this month.